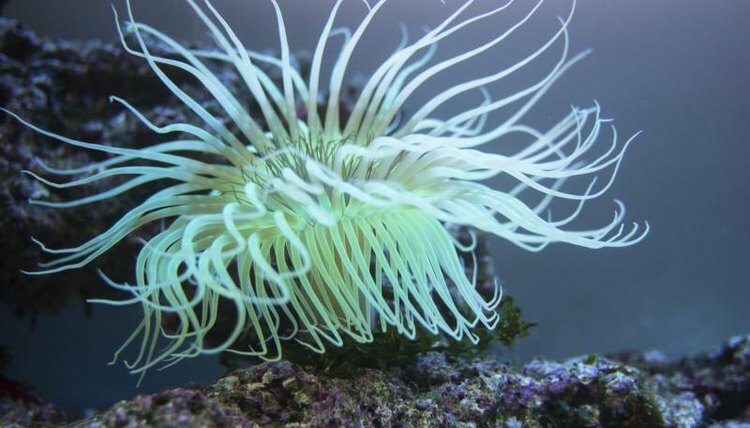 Sea anemones belong to the scientific class Anthozoa, which also includes corals. More than 6,000 species of Anthozoa exist, though only a few of these species are found in tide pools -- that is, the pools of seawater left in eroded rock cavities when the tide retreats. Because these pools are not constantly submerged in the ocean, the flora and fauna often face harsh conditions when exposed by low tide, which is why only a few species of anemone thrive in tide pools. The aggregating anemone is found in tide pools along the Pacific coast from Alaska to Mexico. These anemones are usually small and green with a mouth in the middle that resembles a sucker. Like other anemones, their tentacles contain stinging cells and are used for catching small prey. What is unusual about aggregating anemones is that they are able to split in half, creating clones of themselves. Aggregating anemones form clone clusters with their own clones. If, however, an anemone from another cluster comes too close to one in the clone cluster, the two will begin to sting each other until one either dies or moves away. Giant green anemones can be found along the Pacific coast from Alaska to Panama. These are large anemones that can grow to be 10 inches in diameter and almost a foot tall. Giant green anemones are found in many shades of green, depending on how much sunlight they receive. They run the gamut from bright green when sun exposure is great to pale green when sun exposure is limited or absent. Like other anemones, giant green anemones feed on small prey, such as small fish, crabs and sea urchins, that they catch with their stinging tentacles. Certain types of fish and hermit crabs are able to coat themselves in the mucus the anemones secrete. The mucus coating protects these fish and crabs, essentially making them immune from the tentacles' stings. The starburst anemone is closely related to the aggregating anemone but resembles the giant green anemone. The difference between the giant green anemone and starburst anemone is the radiating lines found in the center of the starburst anemone, which span from the mouth to the tentacles. These anemones prefer warm water and are found off the southern coast of California and down through the coast of Mexico. Unlike the aggregating anemone, the starburst anemone is solitary and does not clone itself. It will fight off other anemones that come within reach of its tentacles. Frilled anemones are found along the Pacific coast from Alaska to northern California, as well as along the northern coast of the Atlantic from New Jersey up to Canada. They are typically white, brown or brick red in color, with long cylindrical bodies. Although they are small when living in tide pools -- growing only about 4-inches tall -- these anemones are capable of growing up to 20-inches tall in the open ocean. Frilled anemones live in colonies and, like the aggregating anemone, are capable of cloning themselves, though they can also reproduce through egg fertilization. They feed mainly on small fish, squid and kelp. Currently residing in Chula Vista, Calif., Shanna Pena has been writing since 2002. Shanna's work can be found on various websites, covering topics in swimming, arts and crafts, beauty/makeup and history. Pena is pursuing a Bachelor of Arts in history with a minor in English and currently attends American Military University.